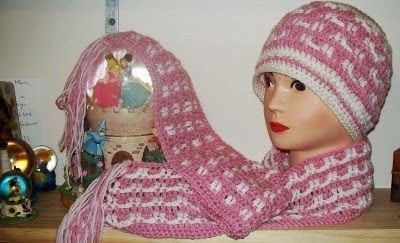 First of all a caution, crochet with rags can become addictive. 1. My first tip is to wash your materials before you begin. If they have been sitting way back in the closet for some time, they may have a stale odour to them. 2. Iron your material if needed. This will make sewing or crochet much easier. 3. If the original stitching is weak, sew over it again. The stitching will come apart and you will then have to knot it if you are up to the crochet step. 4. The thicker the fabric, the thinner your strips need to be. The thinner the fabric, the thicker your strips need to be. 5. If you come across a weak joint whilst crocheting, knot it now to make it stronger. It will come apart eventually. These rag bags make up quite quickly. I made 2 in a day and also decorated and lined 3, with time to spare. 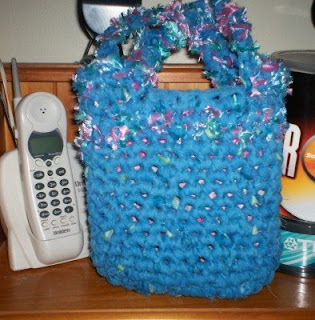 I have used some of that cheap fluffy yarn in the top of the bag above, for decoration. The rags used were from a king size sheet I bought at the op shop. Once again I have used some fluffy yarn at the base of this bag, added some flowers and some pink stitching around the handles. 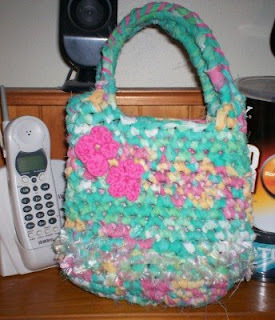 The material is from my daughters doona cover that I mistakenly cut up. This is made from 2 and a half pillow cases, the contrasting colour is from the half a pillow case. The inside flap from the pillow case was used also, I cut thin strips from it to make bows and sewed little buttons onto the centre of the bows. The lining material is from either the contrasting colour I used or bits of scrap materials I have bought from the op shop over time. 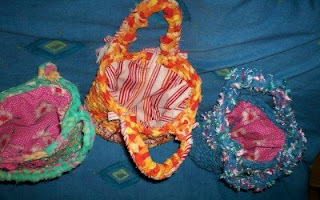 To read more about my rag bags, go here. 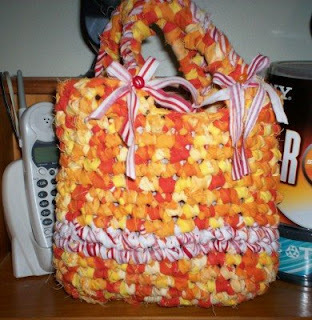 For an easy tutorial on making the bags, go here. For an easy bag lining tutorial, go here.